It seems the Turkish government has recently issued a batch of one-lira coins and the customary portrait of Mustafa Kemal Ataturk, founding father of the Republic, is not on them. Clearly, some say, this is a further indication of the ruling AK Party’s hidden agenda to overturn the secular state and return Turkey to religious shariah rule. So, if not Ataturk’s, whose face will grace the obverse side of the new coin? An Ottoman Padishah’s? That of the current president, AK Party’s Abdullah Gül, or some historical religious leader? In fact, I gather that the new minting is to mark the tenth anniversary of an event which has been a major cultural success for the people of Turkey – the so-called Turkish Language Olympics. One side of the coin, a limited edition of one million, will bear the usual denomination of value, while the other will carry a special commemorative design. 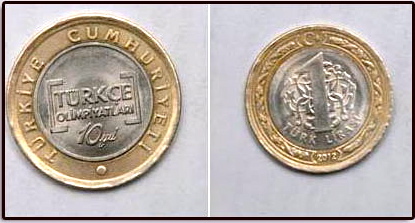 In addition, wealthy enthusiasts will also be able to purchase a sterling silver fifty-lira coin. Now you might wonder about the pretentiousness of such a grandiose title for competitions in a language that has no serious claim to lingua franca status, and furthermore, poses major challenges to would-be learners from other language backgrounds. I can personally attest to the difficulties English-speakers face. A language based on the principle of adding multiple suffixes to a root word such that a single word can require an English sentence to translate, and moreover insists that every vowel in attached suffixes must harmonise with the root according to complex rules that most Turks find difficult to explain, clearly has more in common with Martian or Betelgeusian than any terrestrial language. Nevertheless, in the ten years since the first Turkish Language Olympiad was held, the number of participating countries has grown from seventeen to one hundred and thirty-five. Students from these countries compete in tests of grammar, oral skills, writing essays, reciting poems, singing songs, theatre and general culture. If I were a Turk, I think I would be pretty proud of this event, and the way it was raising the global profile of my language and culture. Evidently the government is, and its members made the decision to issue a commemorative coin. It’s not such an uncommon thing to do, in fact. Many reputable nations with democratically elected governments do it from time to time, without arousing the ire of, or even much interest among their citizens. Since 2004, for example, there have been 126 different commemorative two-euro coins issued by Euro-zone countries. The United States Mint has a similar programme producing quarter dollars for commemorative purposes. There is a branch of learning, numismatics, involving the study of coins, ancient and modern, and some people actually engage in it as a hobby. Nevertheless, it is still possible that the present government of Turkey has some more sinister motive in its minting of the new coin. So I did a little digging, and here’s what I turned up . . .
Ataturk’s picture was put on Turkish money when he became the new Republic’s first president in 1923. Interestingly, after his death in 1938, a law was passed requiring Turkish currency to bear a portrait of the current president. Accordingly, for the next twelve years the face of Ataturk’s close friend and successor, Ismet Inönü, could be seen adorning liras and kurushes throughout the land. The change back to Ataturk occurred in 1950, when Turkey’s first democratically elected Prime Minister Adnan Menderes came to power. Sadly for Menderes, his support for the revered founder was not enough for at least some members of the secular Kemalist military, who ousted him in a coup in 1960, convicted him of violating the constitution and had him hanged along with two of his ministers. When the AK Party government erased six zeroes and issued the new Turkish Lira in 2005, it was remarked by many that the previously grim face which had adorned the hopelessly devalued old currency (1,700,000 to the US dollar) had been replaced with a smiling Atatürk. Some saw this as a sign that the great man was pleased to see his nation’s money returning to credibility. Undoubtedly, wherever he was, he must have had serious misgivings about the competence of his political successors, who were powerless to curb the hyper-inflation that had turned the TL into a joke of Weimar German proportions by the 1990s. I have observed before that I have a long-standing suspicion of politicians of all political persuasions. I tend to judge them by their actions and results rather than their words, which can be misleading to say the least. I have no loyalty to any political party, certainly not in Turkey, where I do not have the right to vote. I can say, however, that the last nine years have seen a period of political maturity and stability such as Turkey had not experienced for some considerable time. The AK Party was brought to power in polls whose fairness has not been questioned as far as I know; and has been resoundingly returned in two subsequent elections. In that time inflation has been reduced to internationally acceptable levels, and economic growth ranks with that of powerhouses like China, India and Brazil. The Turkish government has pursued a foreign policy which has reached out to neighbouring states in the Middle East, North Africa and Central Asia, while maintaining ties of friendship with Europe and the United States. At the same time, Turks have resisted pressure to involve themselves in regional conflicts such as Iraq and Syria, despite strong pressure from Uncle Sam, and provocation from Bashar al-Assad. 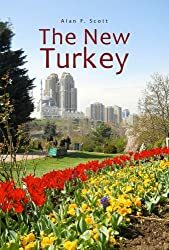 Again, if I were a Turk, I think I would feel some pride in the way my country’s international standing had risen in recent years and in the manifest signs of increasing wealth and growing national self-confidence all around me. I might feel some misgivings about the continuing disparities of wealth distribution, and the obvious lack of a credible opposition party in the legislature. But I hope I might try to channel these feelings into positive political action, rather than constantly harping on about peripheral issues like headscarves and whose picture is on the back of my one-lira coin. This entry was posted in Adnan Menderes, Atatürk MK, Turkish Language, Turkish politics. Bookmark the permalink. I wrote that three months ago – and I still haven't seen one of those coins!